The soup was the start of a whole different eating experience – we’d never had that one before. Usually when we eat here we tend to order dishes along the same lines because we know they’ll be good, every time. This time we decided to try almost all new dishes, except for the baigan bharta eggplant dish because it is one of my absolute favorites. Every time I go to Tandoor I have to order this one; it’s just too good to pass up. Apart from that though, we ordered the fish pakora (so crispy, so delicious. The fish was noticeably fresh with the flesh flaking off in every bite), the lahori fish (pretty much a larger portion of fish pakora – I wouldn’t suggest ordering both this dishes in the same meal), the dhansak with shrimp, pineapple and lentils (not too sweet, actually), the lamb paya (a thinner sauce, less meat than you would expect but tasty nonetheless) and the balti wicked (great thick curry) along with two portions of hot fluffy naan bread and two servings of basamati rice. 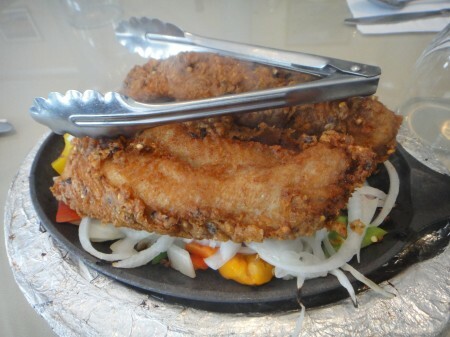 Tandoor & Grille serves consistently delicious and authentic Pakistani food. If you live in downtown Montreal and love south Asian food, this is one place worth driving down to the West Island for. Tags: Balti, Basamati, Chicken, Curry, Des Sources, Dollard-des-Ormeaux, Eggplant, Fish, Grill, Indian, Lentil, Montreal, Onion, Pakistani, Pakora, Pineapple, Rice, Shrimp, Stew, Tandoor, Tandoor & Grille, Tikka, Wicked.